“The top virtue is like water, benefitting all, contending with none, and is content with what all others disdain. It makes a good place, harbours a good will, gives a good wish, does good deeds, yields good results, and grasps good chance. Just because it does not contend, it never goes amiss. Creative talents in Hong Kong are invited to each contribute a message to speak out their minds through Trike Writer. The device moves forward, drips water on the ground and forms messages, just like traditional water calligraphy. Guided tour available. Reservation required. Free admission on a first-come, first-served basis. No reservation. 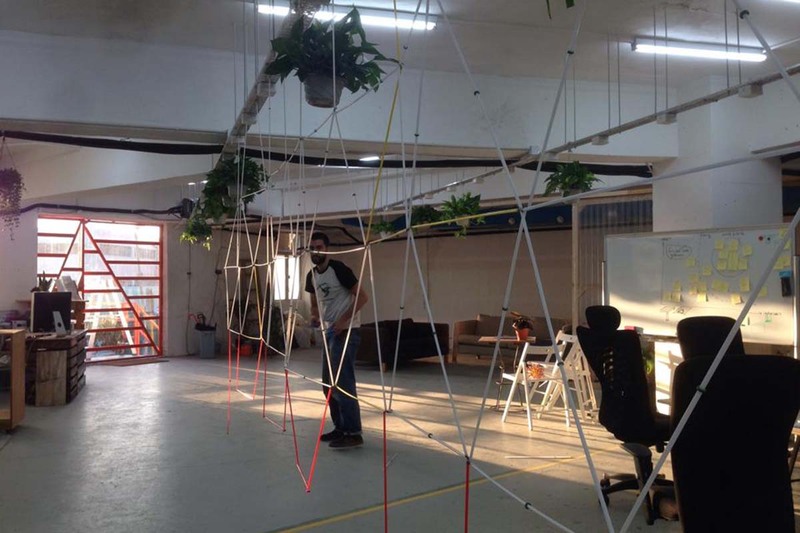 Sticky sticks is one of our invention at MakerBay to bring kids and adults together to build structures together. Sticky sticks were invented with a simple goal to allow anyone who wish to build things with cheap and safe materials to do so. There is no limit to what participants can build, the only limitation is ones imagination! The sticks are very light weight so it would not hurt anyone if it collapse and you can carry them anywhere with you! 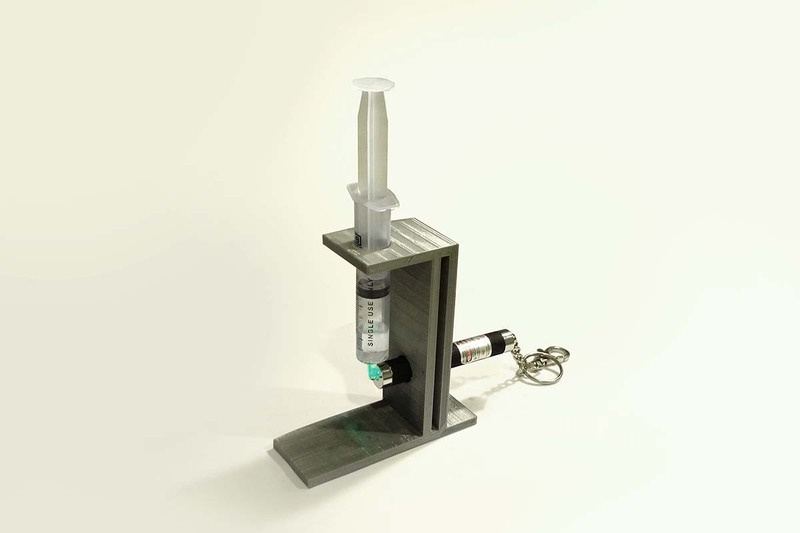 Sticky Sticks是工匠灣的發明，大眾可以在工作利用Sticky Sticks共同協作，創造不同的結構。Sticky Sticks希望使用便宜、安全的物料，讓所有人都能運用想像力，實現無限可能。Sticky Sticks輕巧的設計不但方便攜帶，而且非常安全! Mostly covered up by pretty cases, virtually all of today's technology depends on some kind of electric circuitry. 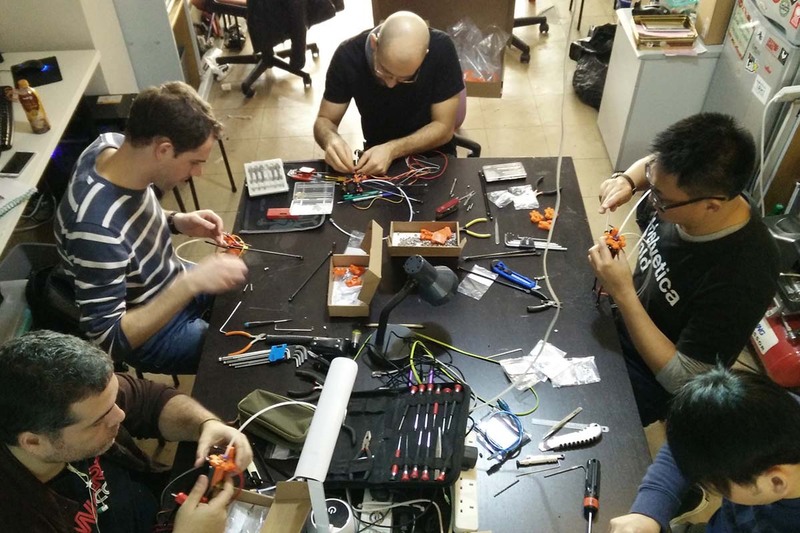 In our soldering workshop we decrease the distance between the participant and the circuit. You connect the dots. You bring life to the board. Who among you can build the mightiest bridge? Who has the superior spaghetti engineering skills? For those of you brave enough, register to join the fun! Form your own team or join one, become an architect and construct a bridge made out of spaghetti. Bridges have to be able to cross a 50 cm distance, and hold as much weight as possible. You will be provided with one box of spaghetti, glue guns, and glue. You provide the nerd power. Microwave Festival began in 1996 as an annual video art festival of the local video art institution Videotage. As technology progressed and became more accessible, video art slowly evolved to involve other media; thus Microwave began to embrace the wider range of new media art. As the first and only art festival in Hong Kong dedicated to new media art, Microwave has steadily grown into a well-established festival that brings cutting-edge works to provoke thought in the technological hub every year. In its 10th anniversary, Microwave Festival celebrated by becoming an independent organisation, completed with a rebranding by design partner Milkxhake and a strengthened curatorial and working team. Microwave then continues the hard work to inspire Hong Kong and the rest of the world with pioneering media artworks selected to suit themes relevant to the society today, while also avidly supporting the exchange and dialogue between artists, professionals and the general public. 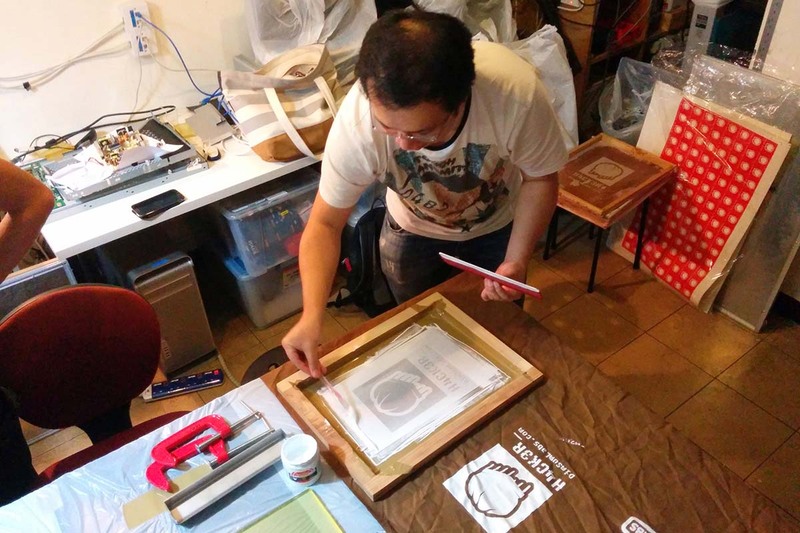 We envision that through the Microwave network, Hong Kong artists will be introduced to international institutions and curators, working as a platform and gateway for them to develop their art and skills. 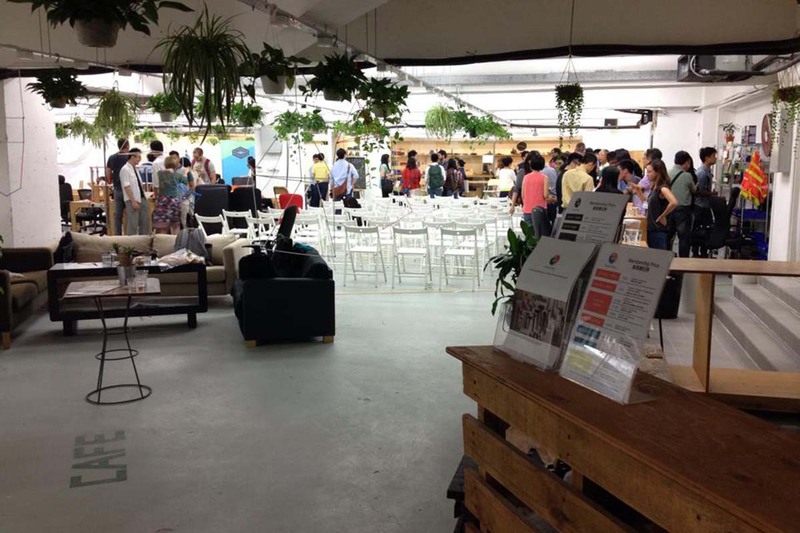 Apart from the grand annual festival, Microwave also endeavours to nurture a rising local new media arts community, organising various programmes such as educational workshops, seminars, forums and exhibitions. 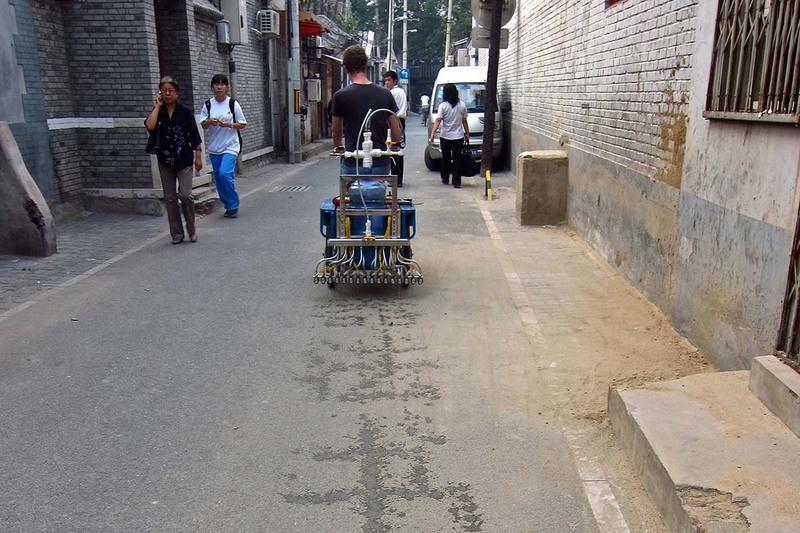 Trike Writer is the second iteration of a project originally created in Beijing called Water Calligraphy Device. 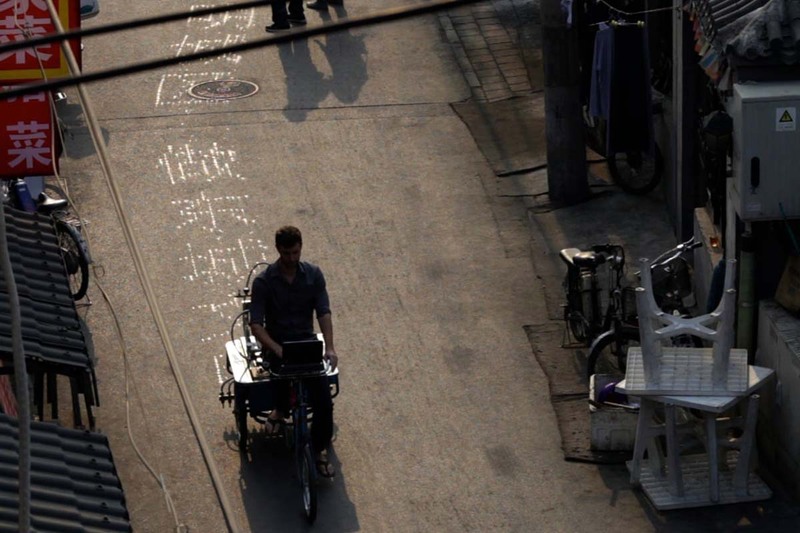 The project is inspired by the Chinese custom of writing calligraphy on the ground in public places using a brush dipped in water. When the artist was living in Beijing in 2011, he enjoyed watching people practice water calligraphy in local parks. 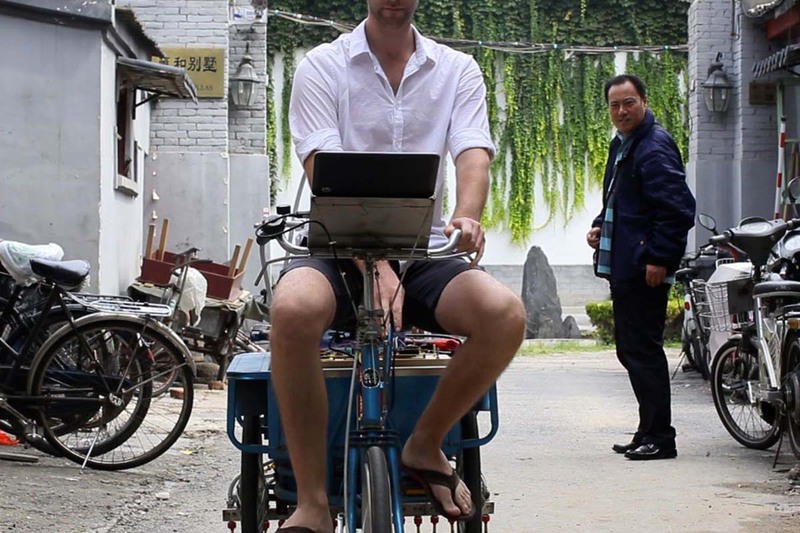 This inspired him to build the original Water Calligraphy Device, a tricycle that writes on the street with droplets of water. Trike Writer is a new iteration of this project. The device is controlled by a computer running custom software written by the artist. The software interprets characters and converts them into patterns of dots. A reservoir of pressurized water is distributed through a bank of 16 valves which release sprays of water. As the tricycle moves forward, the valves are rapidly turned on and off in a manner similar to a dot-matrix printer. This allows the device to write characters and words on the ground behind it. The characters printed by the device are legible for roughly fifteen minutes before they evaporate. The first Water Calligraphy Device was built and performed in Beijing in 2011. This second version, named Trike Writer, was built in Los Angeles in 2015 by the artist under a commission from the Qualcomm Inventor Lab using the advanced DragonBoard 410C running a Qualcomm Snapdragon processor. 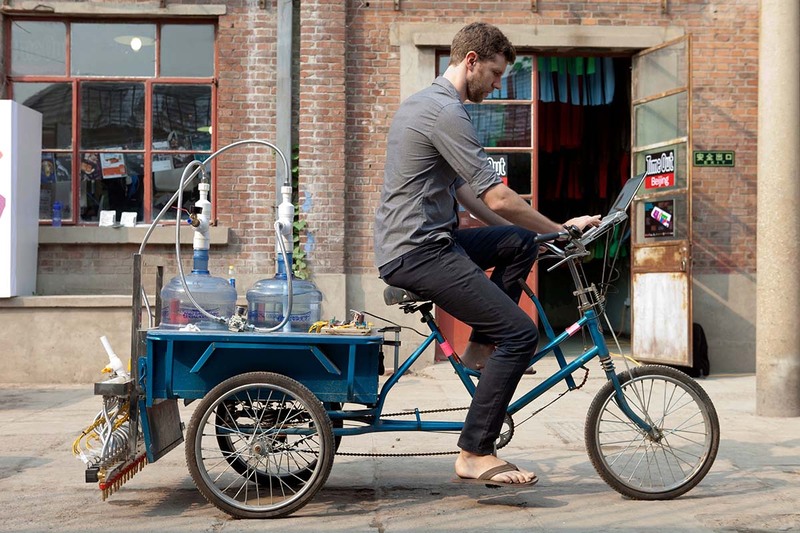 Trike Writer consists of two main systems: a pressurized water system and an electrical system. The water system begins with a 50 litre air tank charged to a pressure of 120 psi. The air from this tank feeds into a 150 litre water reservoir, which maintains a regulated pressure of 40 psi. 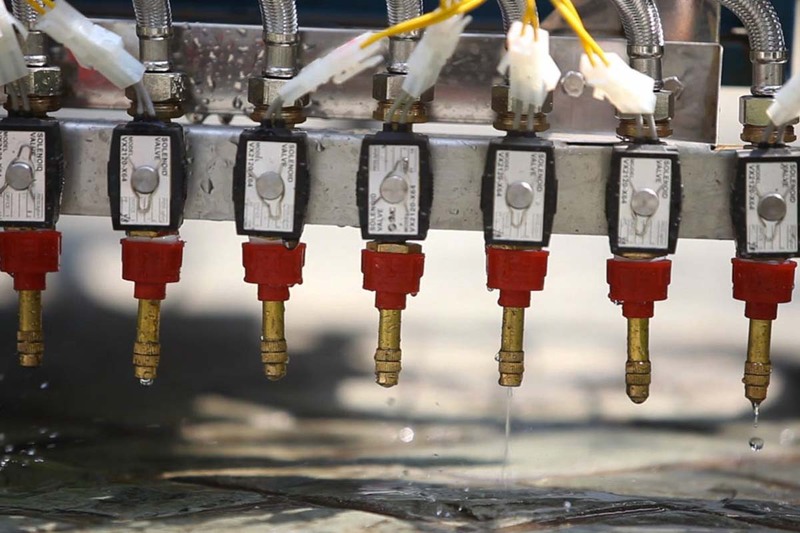 The pressurized water from this tank feeds into a distribution manifold which connects to 16 solenoid valves. These valves are actuated by solid state relays connected to an industrial PLC which receives commands from a DragonBoard 410C running a Qualcomm Snapdragon processor. Custom code on the DragonBoard interprets each character and converts it into a 16 pixel resolution bitmap image, which can be sent to the valves, line by line, as the tricycle moves forward. A quadrature encoder in contact with the front wheel allows the device to adjust the valve timing in response to the travel speed of the tricycle, to maintain consistent printing at varying speeds. A 24v battery provides power to the electronics and solenoid valves. Nicholas Hanna, born in 1982, is a Canadian artist, designer and inventor who builds performative devices. 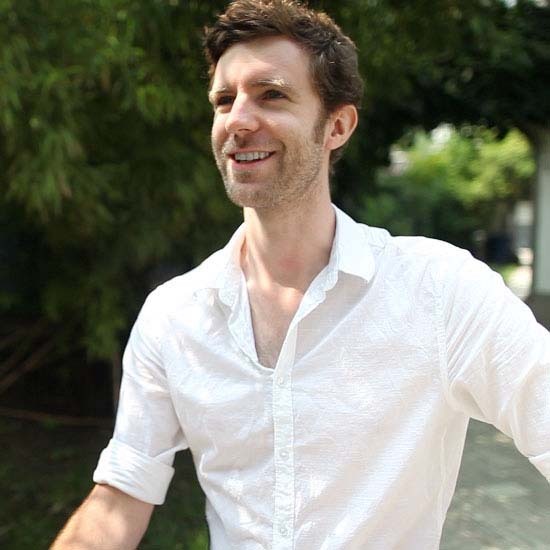 His background is in architecture: he trained at McGill University in Canada and Yale University in USA and worked for several years in the field. In 2009, while working in Beijing, he shifted his attention from architecture to the creative use of technology. Hanna works within the triangle delineated by software code, hardware circuits and mechanical mechanisms to make objects, devices and installations that explore the aesthetic and affective potential of technology. He currently resides in Los Angeles, California. As children, we are fascinated by bubbles. We love to make them, chase them and pop them. 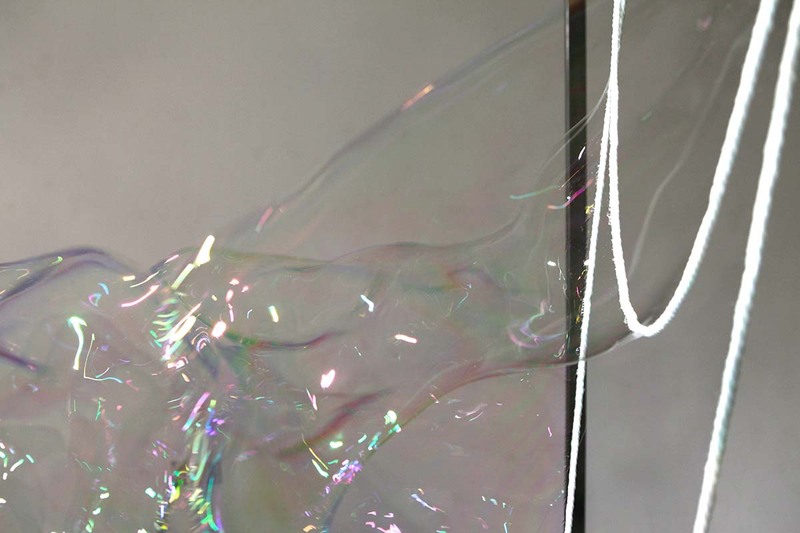 Bubbles are strange: they seem to ignore gravity and float aimlessly with incredible delicacy. 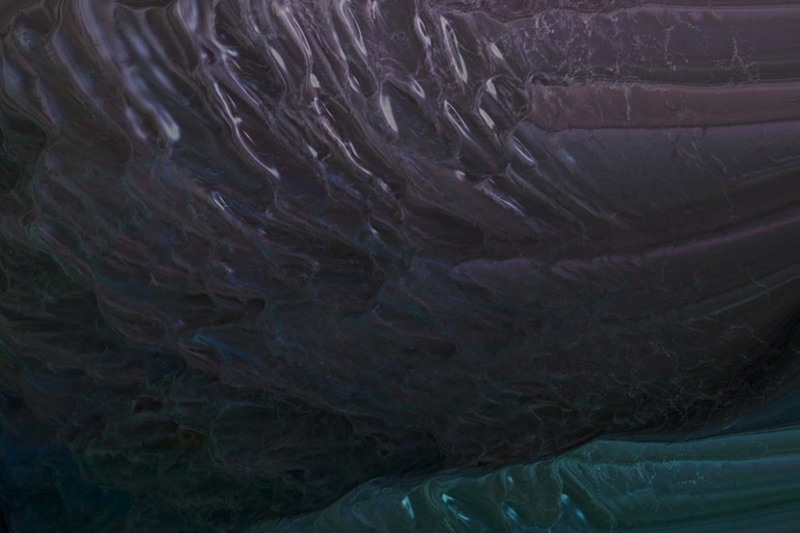 They are gossamer structures that are simultaneously colorful and transparent. They will hold a child's rapt attention. Their very strangeness is what makes them so fascinating: they don't seem to obey the rules that other objects conform to. They float instead of falling to the ground, and you can't hold them in your hand without destroying them. As with all things in life however, experience breeds familiarity. 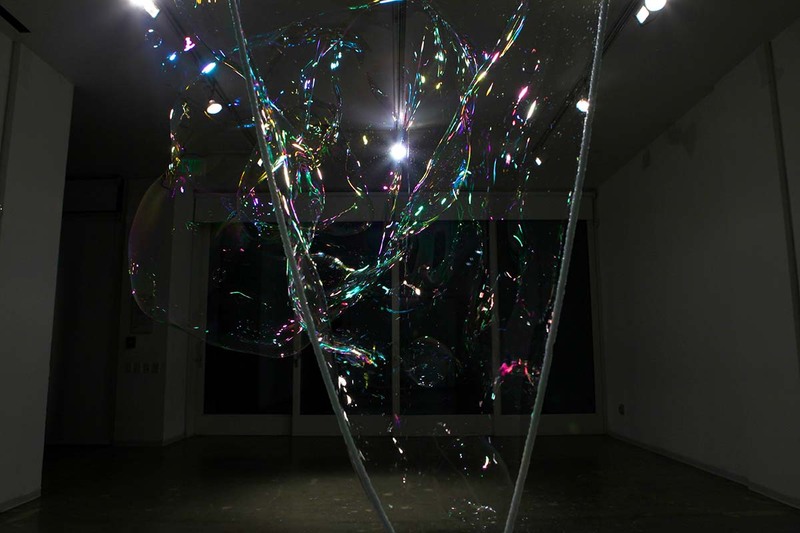 As we grow older, our fascination with bubbles fades into disinterest. Bubbles become a known fact about the world, and we are no longer enchanted by them as we once were. 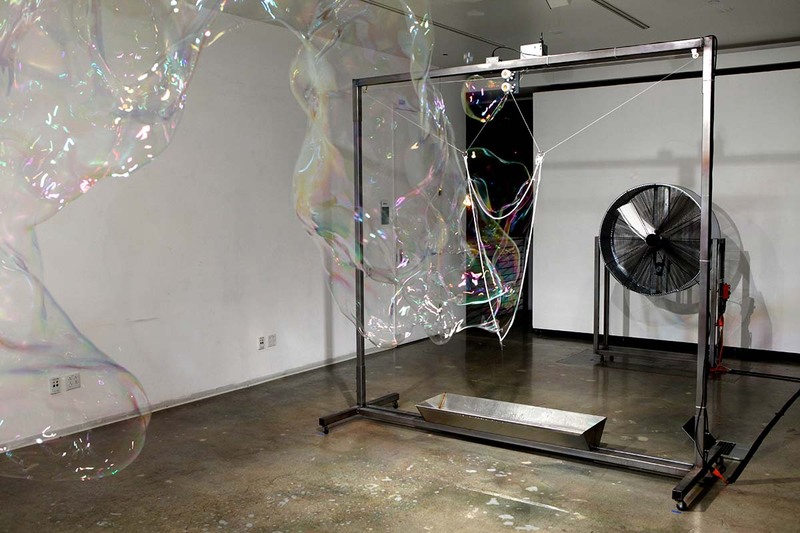 Bubble Device is an exercise in the serial creation of objects of intrigue. 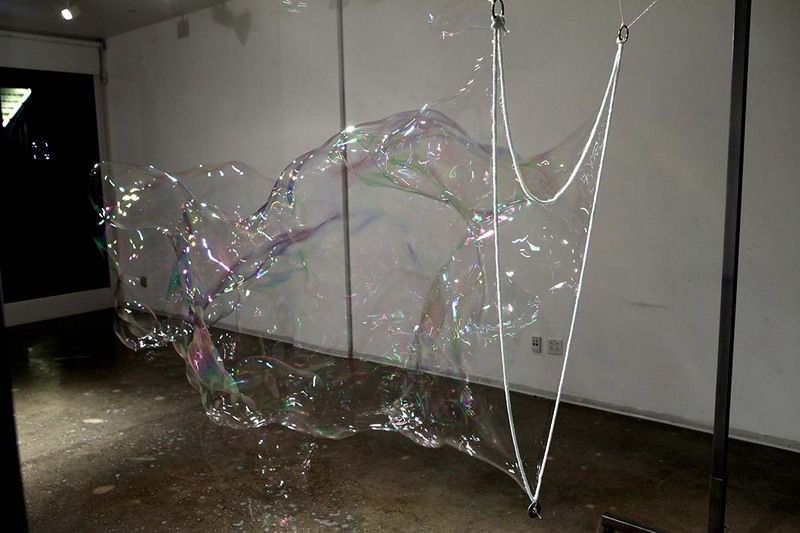 With the motorized control of an absorbent rope loop, a special liquid solution and an industrial fan, Bubble Device creates enormous bubbles. It admits us to a state of childlike wonder, in which we can sustain rapt attention, a precious state of mind in which we take in the world directly, without evaluation or judgment. 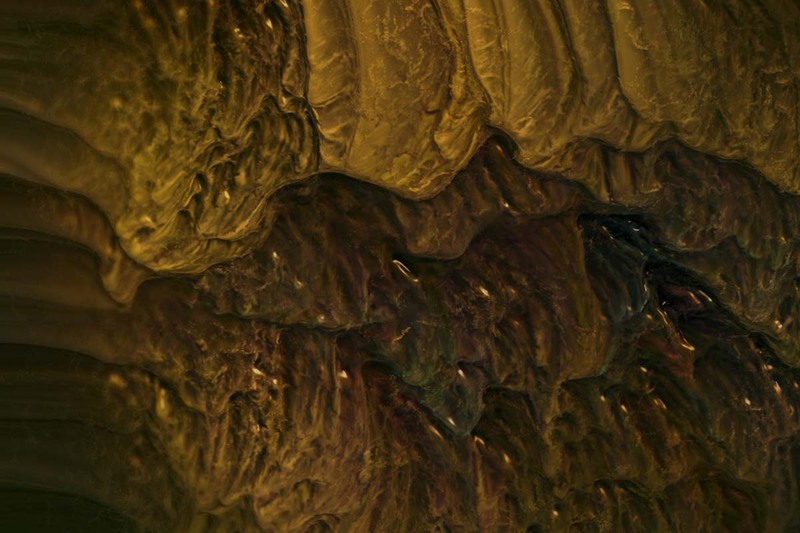 The continuously variable and undulating forms invite close observation. Even the most staid of adults is tempted to raise their arm, extend their finger, and pop a bubble. Bubble Device employs two stepper motors attached to a custom designed pulley system to manipulate a loop of absorbent cotton rope. The rope is lowered into a trough of bubble solution, then raised and opened in the air current generated by large diameter industrial fan. The motor of the industrial fan has been replaced with a DC motor to enable precision, low speed control. 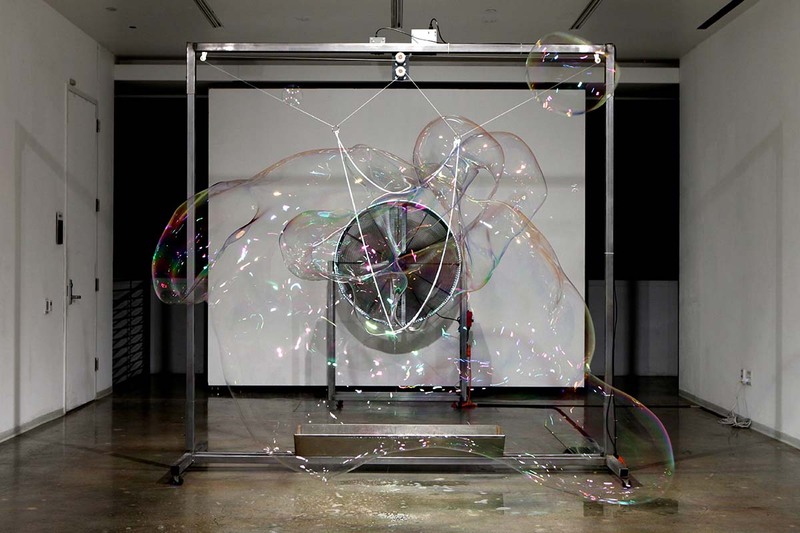 Custom software drives the motors with precise timing to position the rope in a series of poses that encourage the formation of large bubbles. 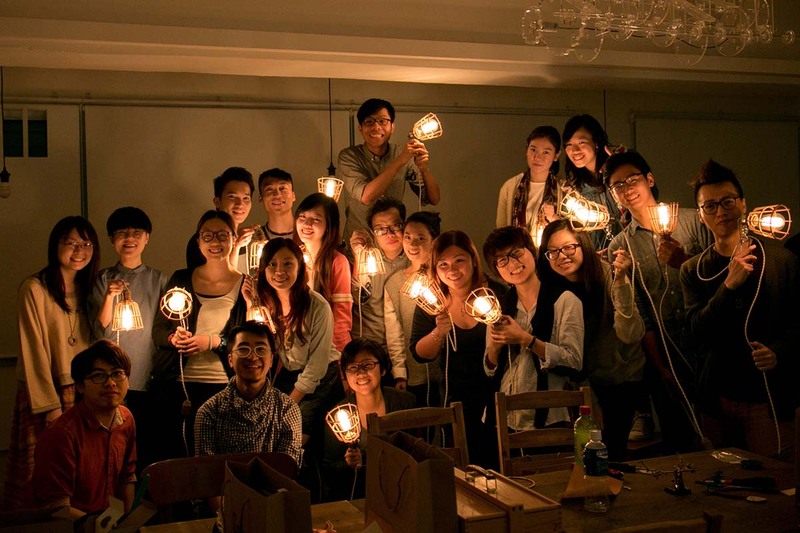 Inheriting the spirit of Fab & Craft, LAB by Dimension Plus is a cultural and creative open space for self-fabrication. 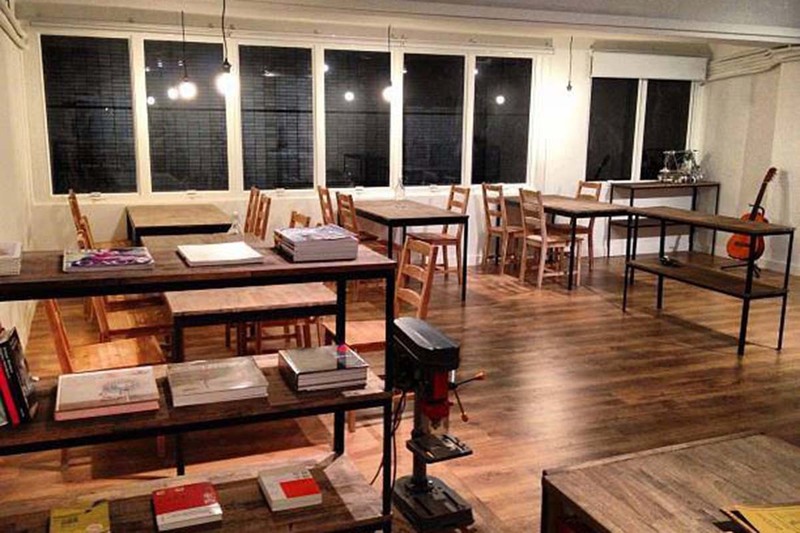 LAB by Dimension plus is well equipped with various machines like laser cutter, 3D printer, egg shaped plotter and other necessary tools for Fab & Craft, offering a chance to use and participate in different experiments and invention to DIY things. 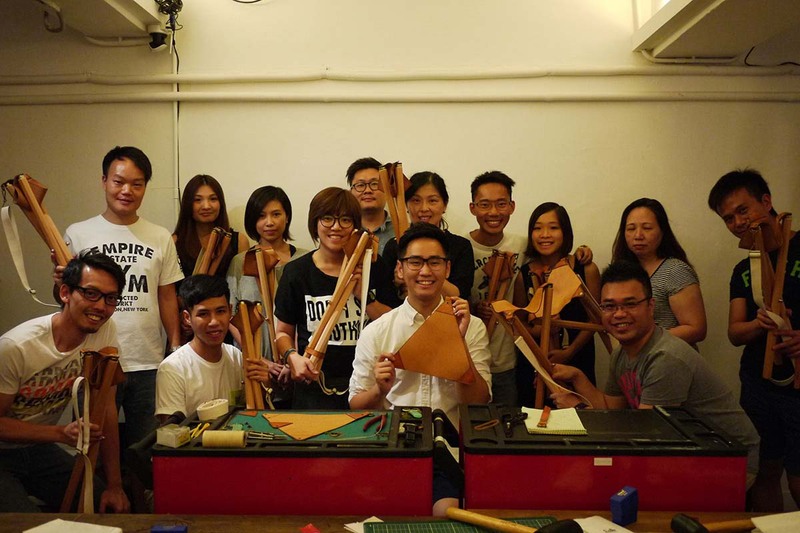 LAB by Dimension plus is not only a place where makers can share their self-fabrication products; it is also a community to connect makers from different sectors and provides them an open space for activities, interaction and collaboration. 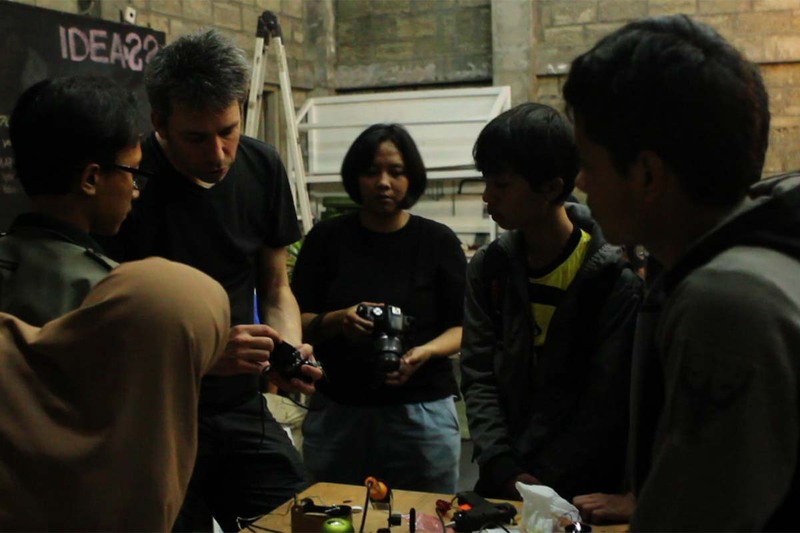 We will also invite makers from all over the world to conduct workshops, exhibitions, performances, talks and gatherings. As Neil Gershenfeld, the founder of Fab Lab, said, “You can make (almost) anything in the Lab!” As long as you have a good idea, you can make things happened here. We welcome imaginative makers to use our tools and space to realize your dreams! We will exhibit works that were designed by LAB by Dimension Plus and the makers in our lab, every single procedure from design to production happened in our LAB. 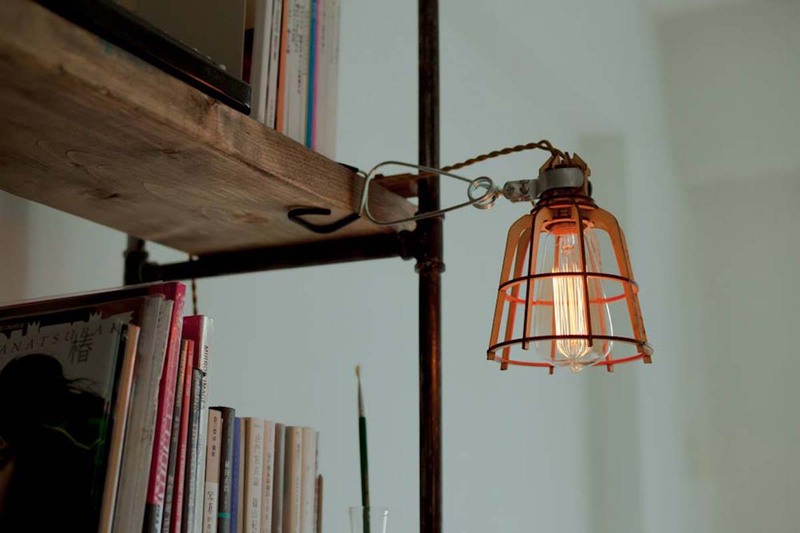 Traditional media usually gives us a stronger sense of warmth. When we are enjoying the music from the digital media in a more convenient manner, the imperfectness of vinyl reminds people the texture of humanity. Turntable combines makers’ spirit and digital fabrication. 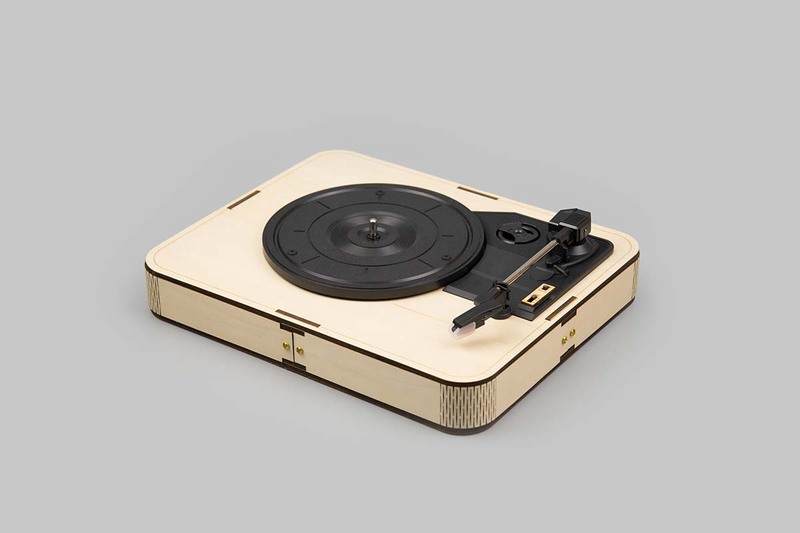 The precise woodcutting together with the turntable connects people with the originality of music. When we put the stylus onto the turntable, we call back or sensory of music. 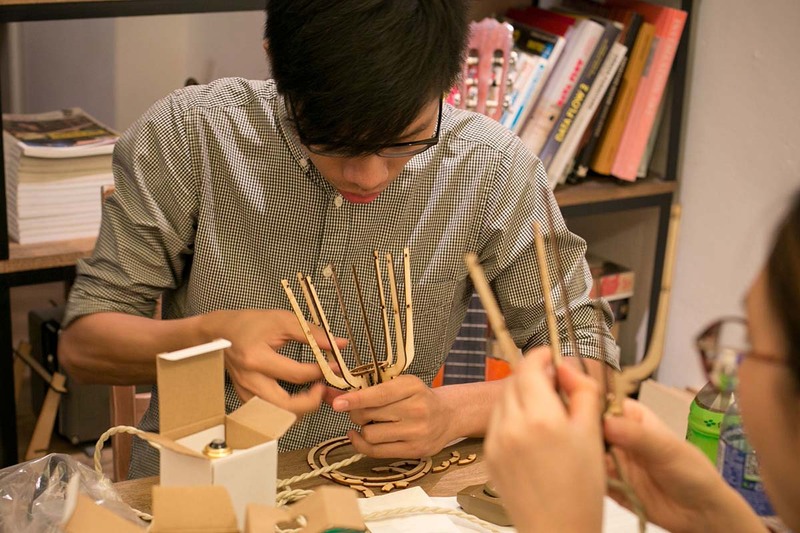 Every component was made by laser cutting technology, then matching the texture of wood and incandescent light bulbs, Lamp 001 lets people experience the power of digital fabrication through assembling and soldering. 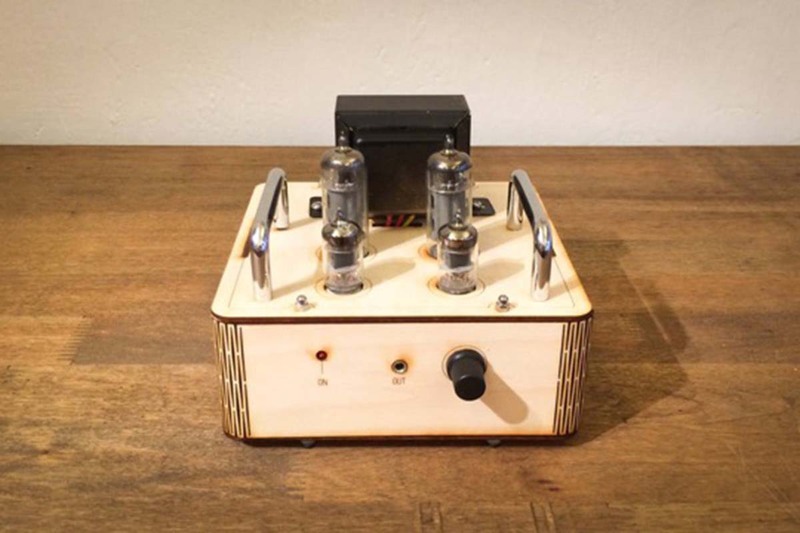 From soldering electronic components to making the wood surface, all the production processes were completed in the lab and the Tube Amp is a good model to illustrate the energy of makers! Using antenna to detect the distance of hands to create different sounds and volumes. Theremin perhaps is one of the first electronic instruments in the world and this version of Theremin uses sensor to replace antenna, maintaining the unique gestures of playing the instrument. 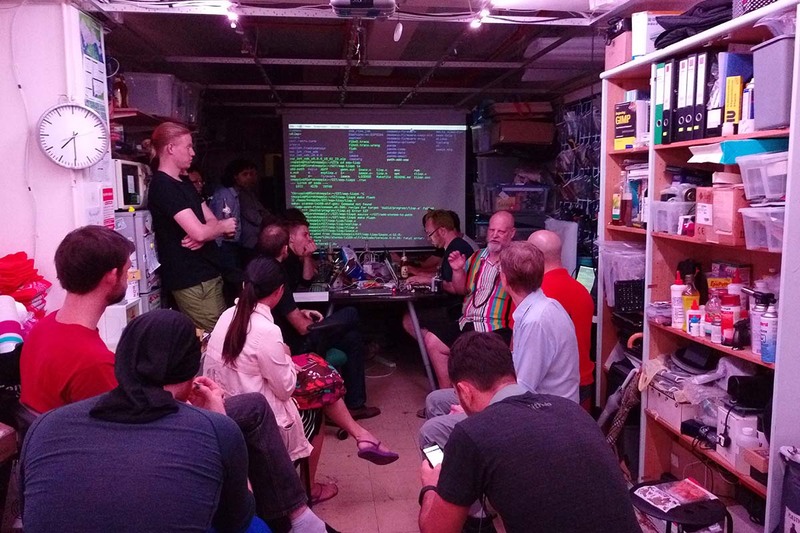 A hackerspace (also referred to as a hacklab, makerspace or hackspace) is a community-operated workspace where people with common interests, (often in computers, machining, technology, science, digital art or electronic art) can meet, socialise and collaborate. We understand "hacking" as the intellectual challenge to creatively overcome, circumvent, deconstruct or otherwise “hack” the limitations, capabilities, purposes, forms, etc. of virtually anything. Our mission is to explore various self-organisational forms in an effort to deepen our understanding of how organisations can implement environments in which creativity blooms. There is a gap in Hong Kong’s political and socio-economical landscape, leaving only very little space for creatives to pursue their projects. Dim Sum Labs aims to address these “lost” segments of society. 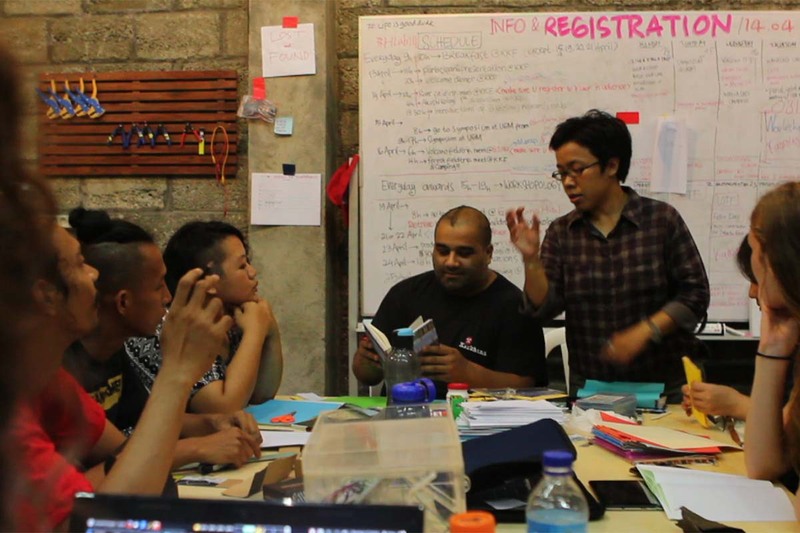 Our backgrounds run the gamut; from lawyers to designers, IT analysts to architects; it is about "we" and not "I" because with the inherent nature of a hackerspace, it is a collaborative effort that builds the community for each other and the greater community. 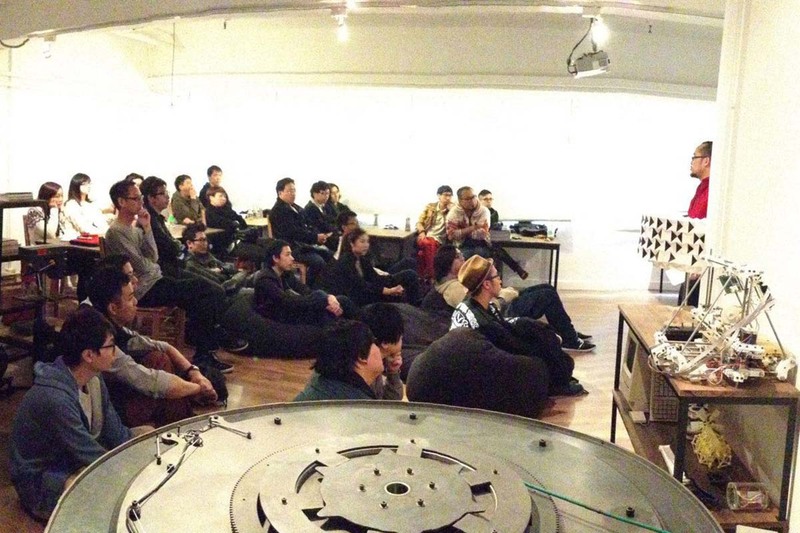 On the surface, the work of Dim Sum Labs is the intersection of technical experimentation and science, before art. The stratum that links our esoteric playtime with human and data connections involves re-thinking the utilisation of our city and our spaces, both physical and virtual. In order to emancipate the constraints of our environment by bringing science and technology down to the everyday person, we “hack” the norms, rules and technologies that occupy our minds and information channels today. Particular for Microwave International New Media Arts Festival, we unravel what otherwise remains hidden: the invisibility of wireless transmission; magnifying Hong Kong’s micro-citizens and mapping their behavior in relation to their macro-counterparts; the uncanny yet simplicity of uranium; and the whimsy of automation. 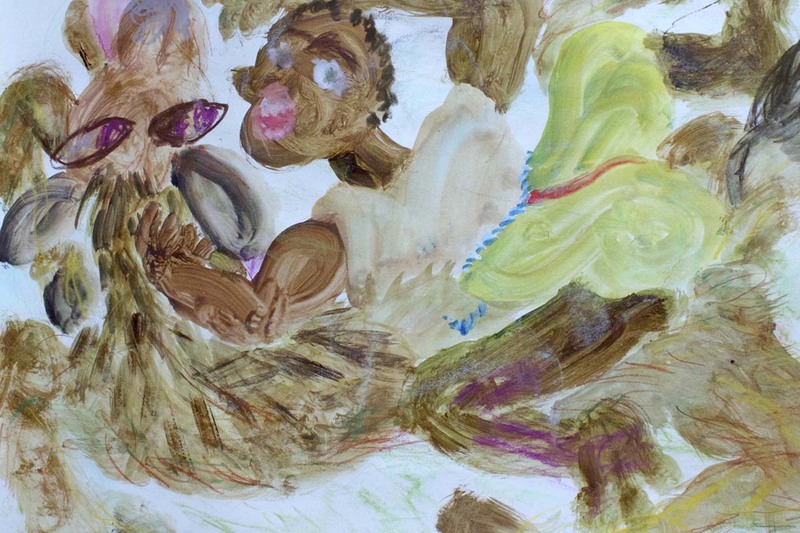 With these works, we provide proximity where there usually reigns divisions, opening up the black boxes that define our lives and let “the user” take charge over the circuitry. What is better other than a tasty hack! 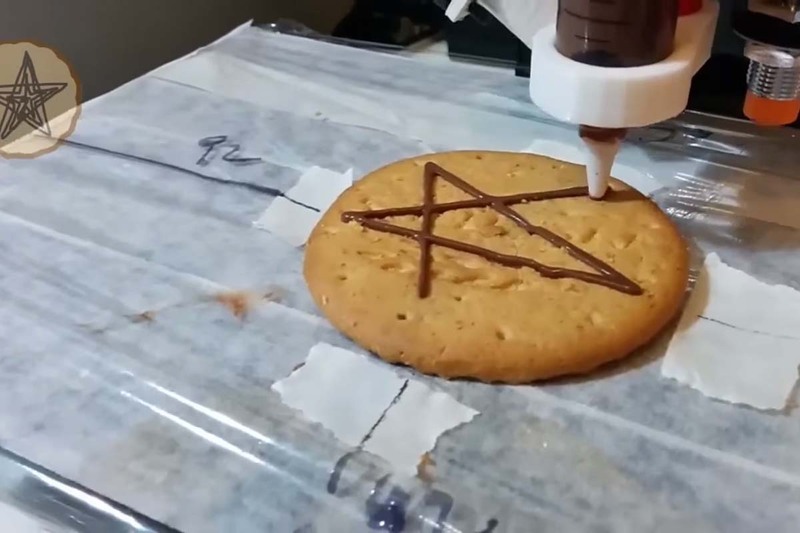 This 3D printer has been hacked to print with nutella on biscuits. You can design your very own cookie by drawing shapes on your mobile. https://www.youtube.com/watch?v=I4Eek7HiirY . What does it do? It glows blue/violet and green, looks like some sort of Iron-Man style Arc reactor and is just generally awesome. 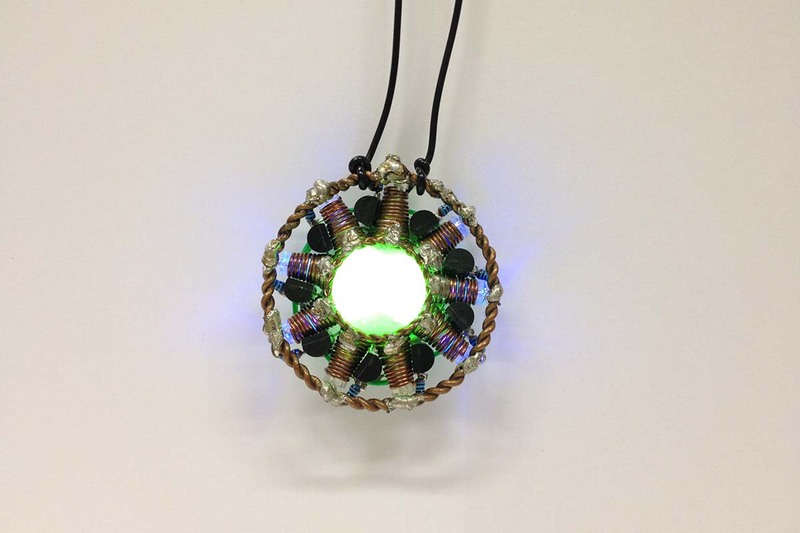 Using a bunch of simulated NOT-Gates, UV LEDs and a uranium enriched glass marble, this pendant creates the illusion of a spinning radioactive element in the middle -- completely analog and without the need for any microchips. Inspired by a study on cognitive substitution/addition/enhancement based on adaptive neuroplasticity. Especially during the 20th century, many studies have proven the brain to be incredibly plastic and sensory input and processing much less static than once thought. Some blind people, for example, are able to use clicking sounds to simulate a similar kind of sonar radar as used by bats or military submarines. There, the sense of hearing is used and substitutes for the sense of sight. The following project presents a way to test brain plasticity by substituting / adding another sense to everyday life. 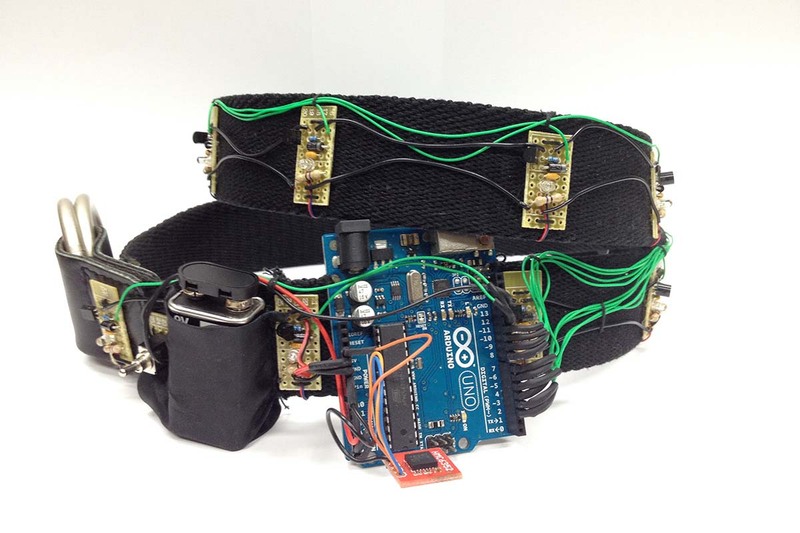 Using a total of 12 vibrating motors (salvaged from cellphones), the belt provides direct information about relative orientation and always keeps the motor buzzing that is pointing towards north. For the first week or so, the wearer has to deliberately acknowledge the buzzing and translate that into the knowledge of relative orientation. Once the wearer gets used to the belt, however, the substitution becomes more complete and he ceases to actively recognise the buzzing motor and instead, his/her brain incorporates these signals on a more intuitive, subconscious level and the wearer gains a literal 6th sense. 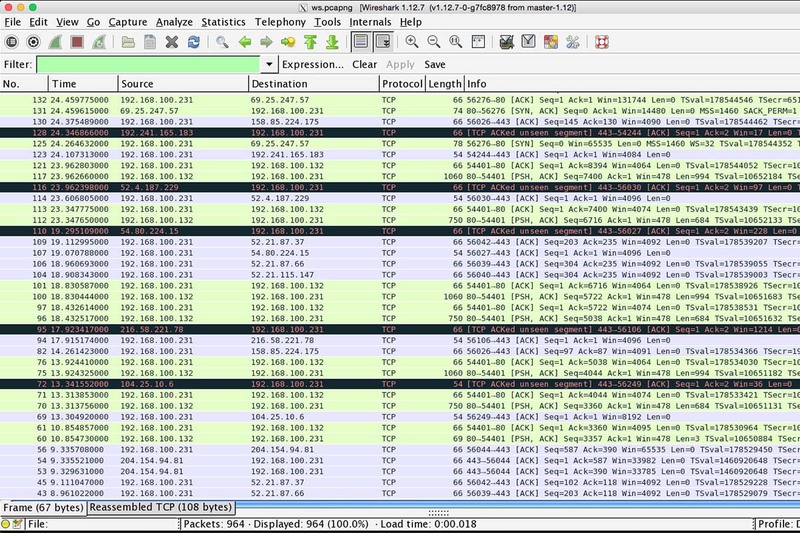 The wifi sniffer pulls the signal noise and information cloud that surrounds every owner of a smartphone from the invisible spectrum of electromagnetic waves and plots it on a continuously shredded paper. A visual representation of the ever-fading presence of our personal data-sphere. Magnifying the microbial life in water samples from around Hong Kong, we map the movement, behaviour and interaction of these mosty ignored "citizens" of the Hong Kong biosphere. Do people in their different districts identify with their microbial forms? 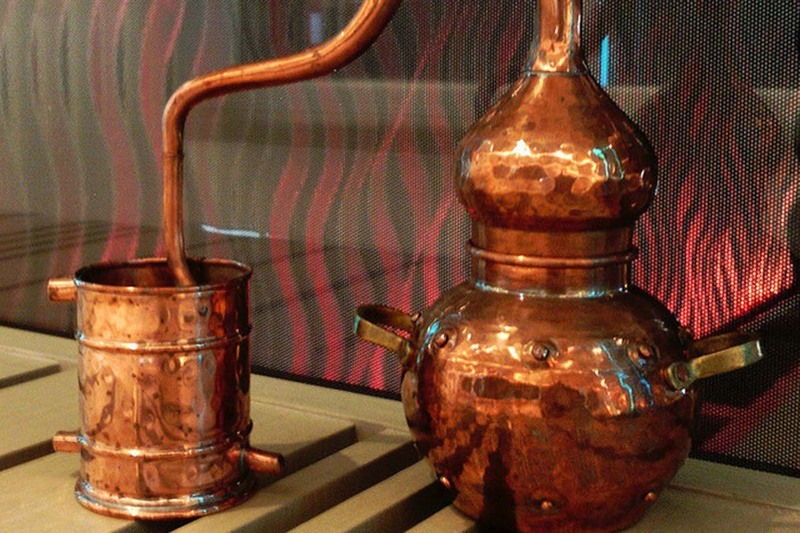 Distillation is one of the oldest and most effective methods to purify and isolate room temperature liquids. It is as effective today as it was in antiquity. This device is named in honor of St Rafka of Lebanon, whose homeland was once populated with coppersmiths who perfected the alembic, the instrument of choice of the alchemist. In the spirit of science and invention embodied by those who practiced alchemy, this device strives for the seemingly impossible: clean water with 100% efficiency. 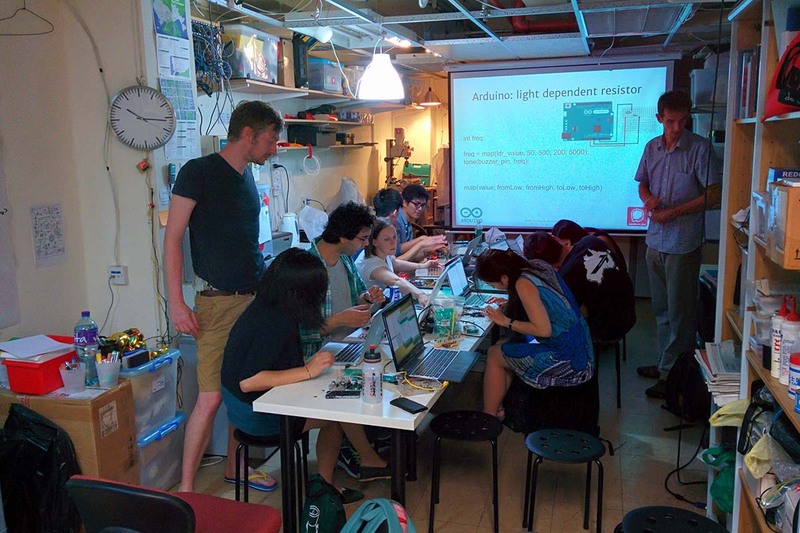 MakerBay is a MakerSpace in the heart of Hong Kong that has great space, tools and community. 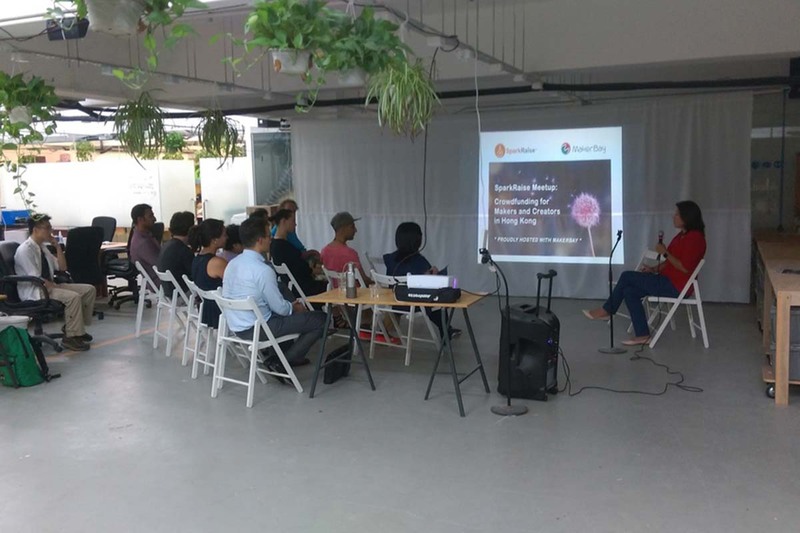 You can come to learn new skills in our classes or participate exciting events, develop your invention or grow your business, or use our wide range of services, from consulting to digital fabrication. 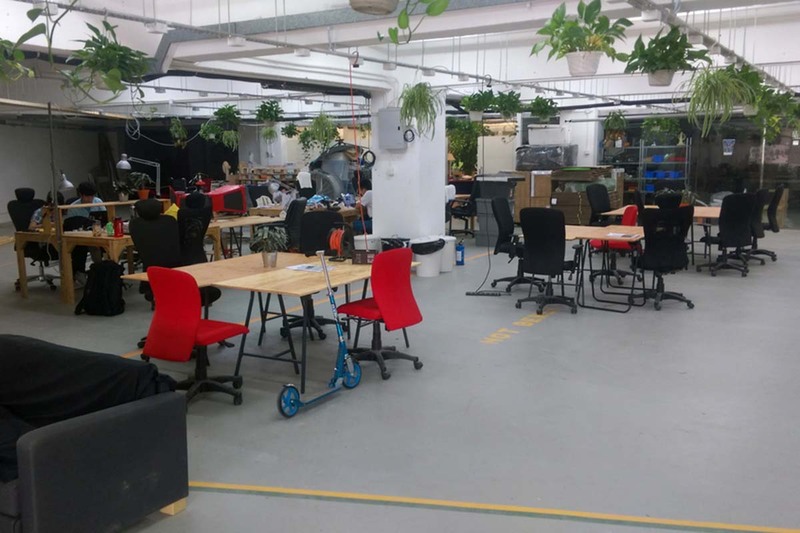 Whether you are a scientist, an engineer, a designer, an artist, beginner or expert, Makerbay is a magic place where you can make (almost) anything! 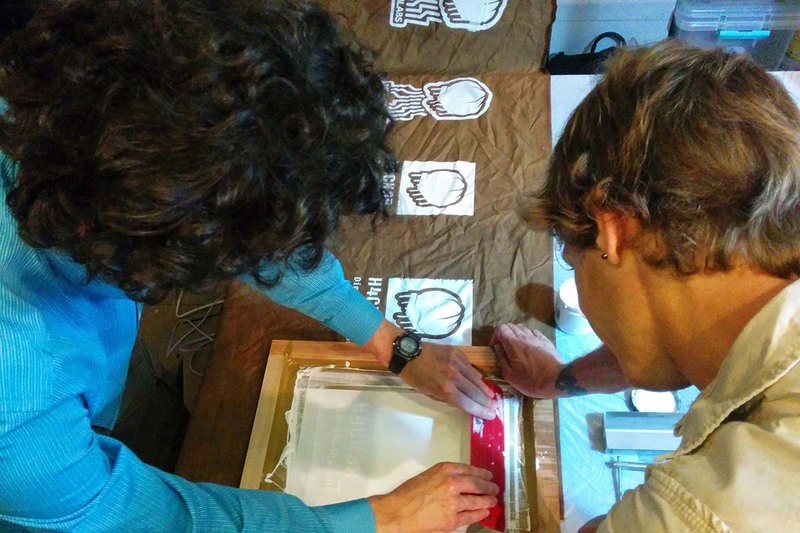 At MakerBay, we believe everyone is a MAKER. Being a maker is about unleashing your creativity by using your hands and heart to make things. 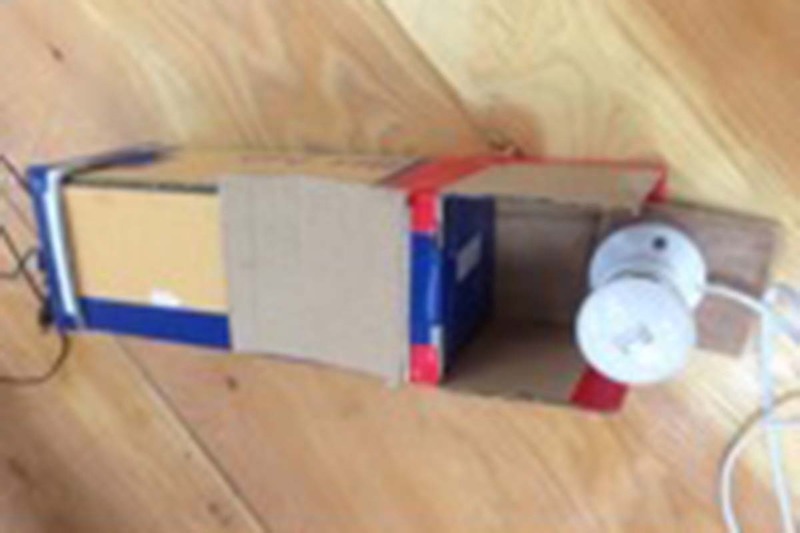 The 3 items shown at Microwave was made by school kids in Hong Kong, they are all simple technology that designed with environmental purposes, e.g. 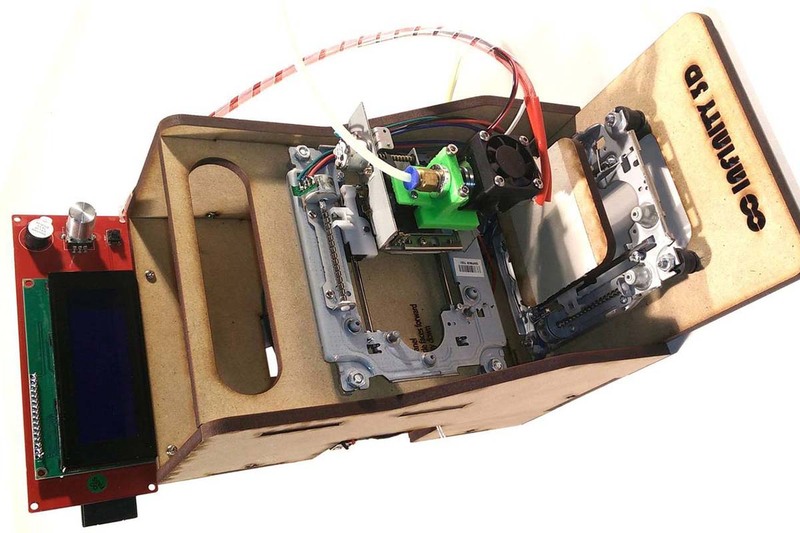 a windtrain, spectrometer for environmental monitoring, 3D printer made with electronic waste, etc. 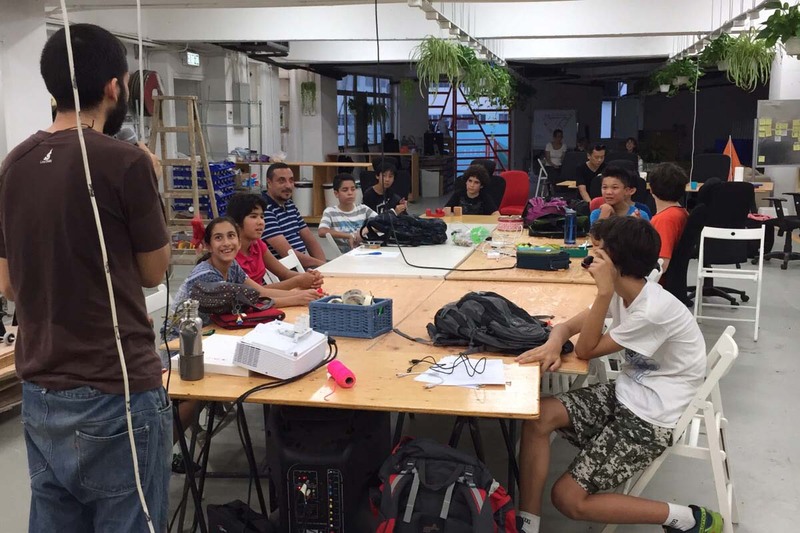 Also, we will also display, one of our invention at MakerBay, Sticky Sticks, to bring kids and adults together to build structures together during Microwave 2015. Sticky sticks were invented with a simple goal to allow anyone who wishes to build things with cheap and safe materials to do so. There is no limit to what participants can build, the only limitation is ones imagination! The sticks are very light weight so it would not hurt anyone if it collapse and you can carry them anywhere with you! 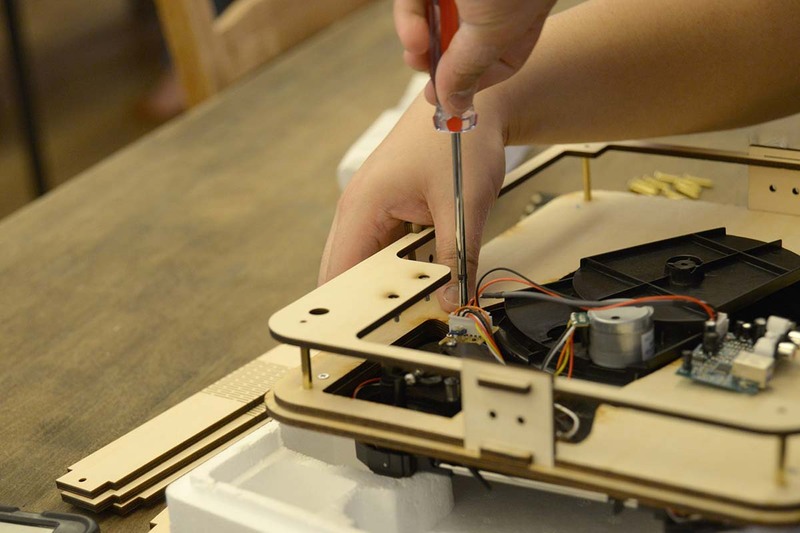 The Curiosity 3D Printers were built by kids of age 10-12 making use of electronic wastes in our workshop. Through that workshop, we hope kids will appreciate the importance of waste reuse and upcycle, and learn useful assembly skills. 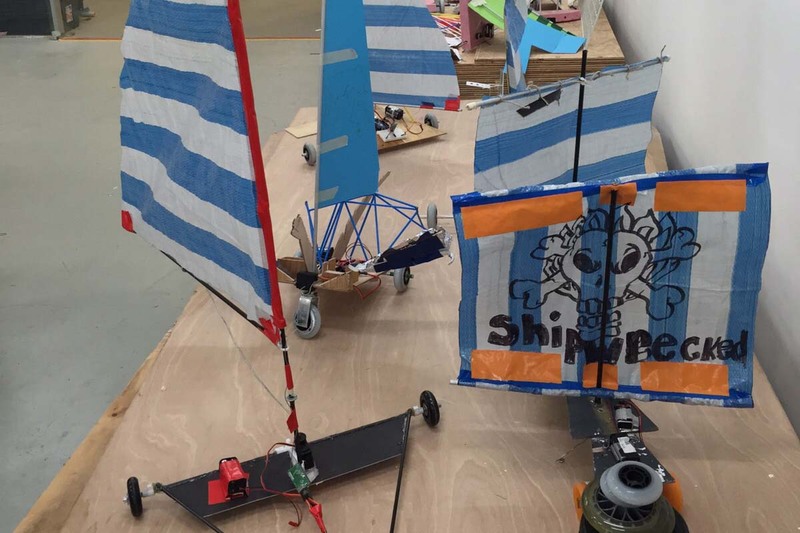 A group of students built the windtrain over a week in August 2015. Wind train is a modular vehicle powered by wind, using only a small battery that we find in mobile phones for steering. Students using waste materials at MakerBay to build the model and write an android app to control it. A spectrometer is a device that split likes into spectrum, like a droplets in the sky after rain that forms rainbow or a prism. 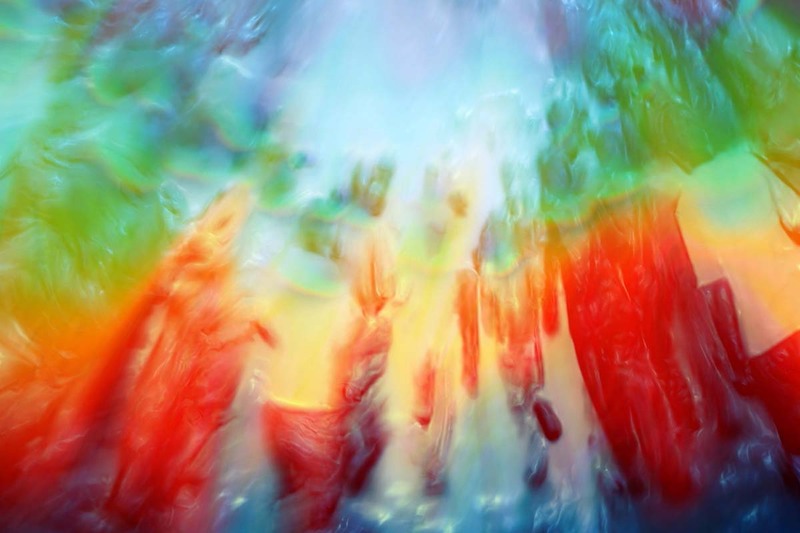 A spectrum is like a signature of substances, each substance will form a unique spectrum, e.g. mercury has a different spectrum from helium. A spectrometer can also used as an environmental monitoring device to understand what substances can be found in our environment. 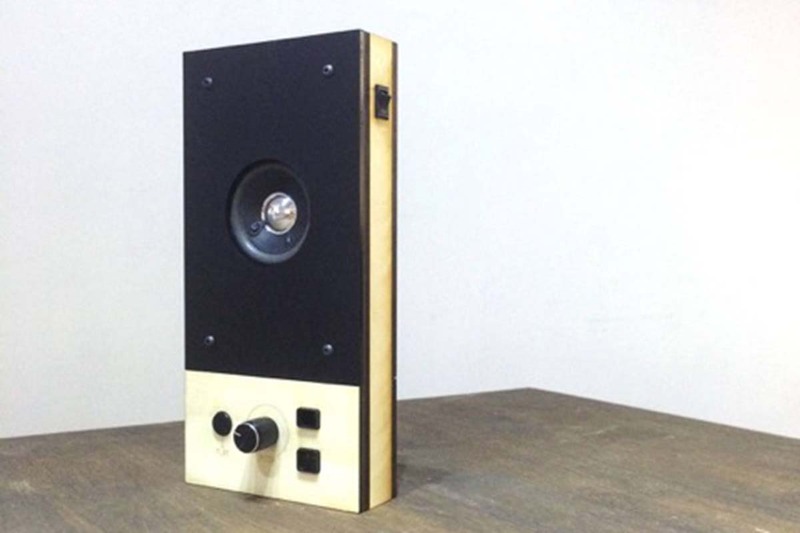 This device was built with waste materials from our workshop for a student workshop. 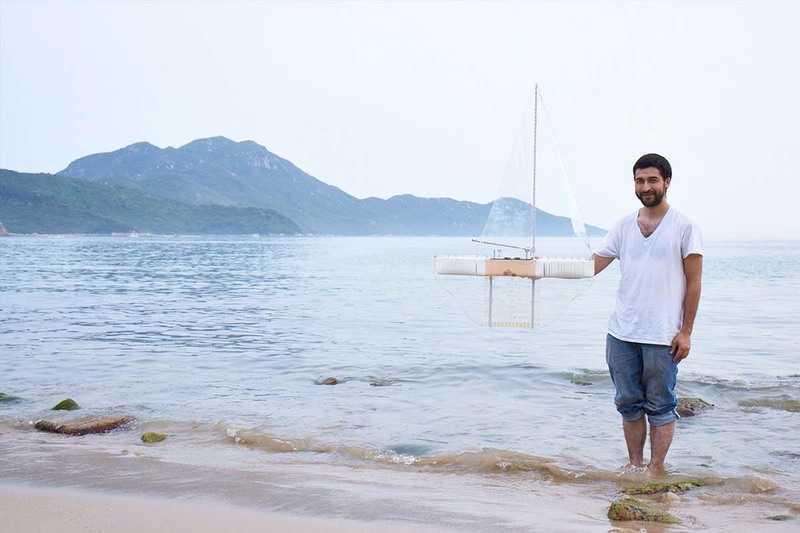 Protei 011 is the first wind-powered robot with a controllable shape-shifting hull. Most sailing boats have a centre board and a rudder; Protei's entire hull can be controlled remotely providing amazing maneuverability and sailing behaviour. We believe that the controllable hull is the next step in the evolution of sailing science. 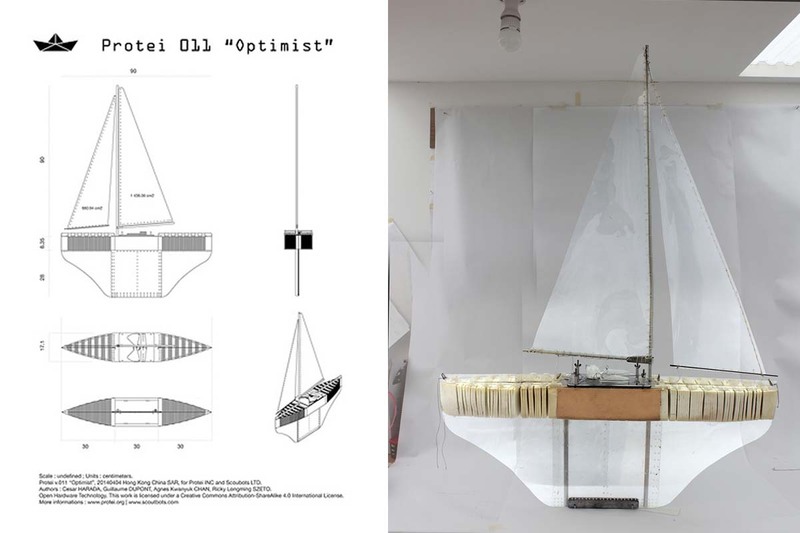 Protei is also an extendable modular sailboat. 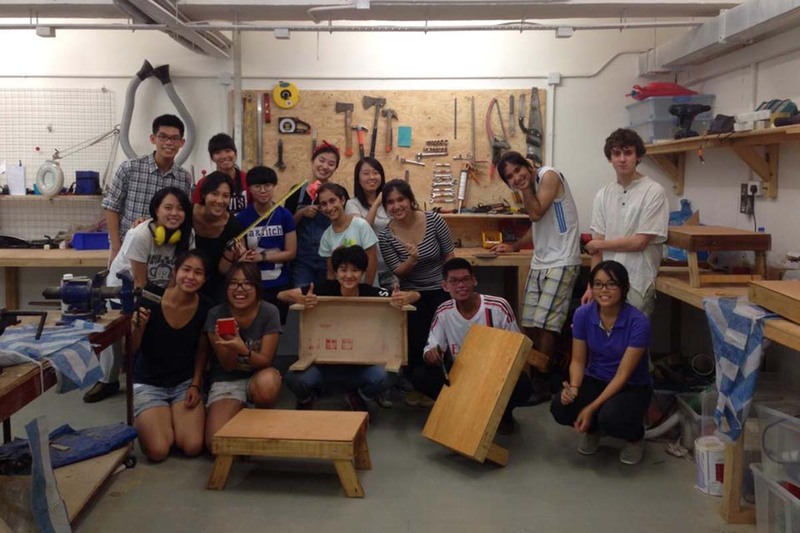 We currently hand-craft each Protei one by one in our workshop in Hong Kong, sanding the foam and smelting the lead. Masakatsu Takagi was born in 1979 in Kyoto, Japan. Takagi is a video artist, composer, and piano player, working across the genres of art and music. 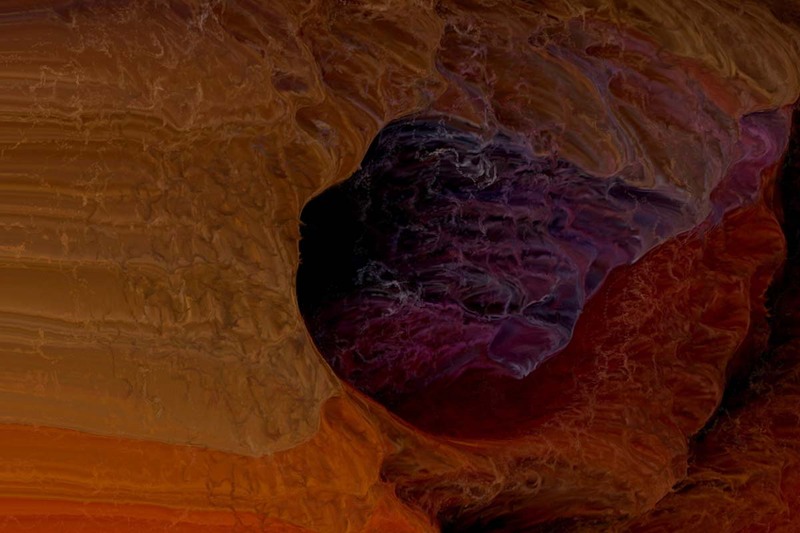 His video works are flawless blend of music of his own composition and digitally processed and animated images that originate from movie clips and photographs he shot during his travels around the globe. 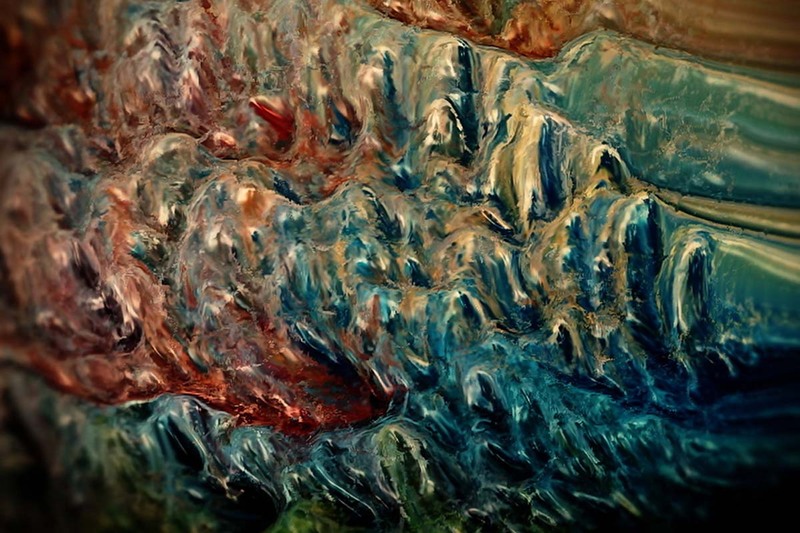 His video installations are often referred as “painting in motion”, with each frame of the video flooded with dynamic flow of colors and shadows impeccably harmonized with sound. 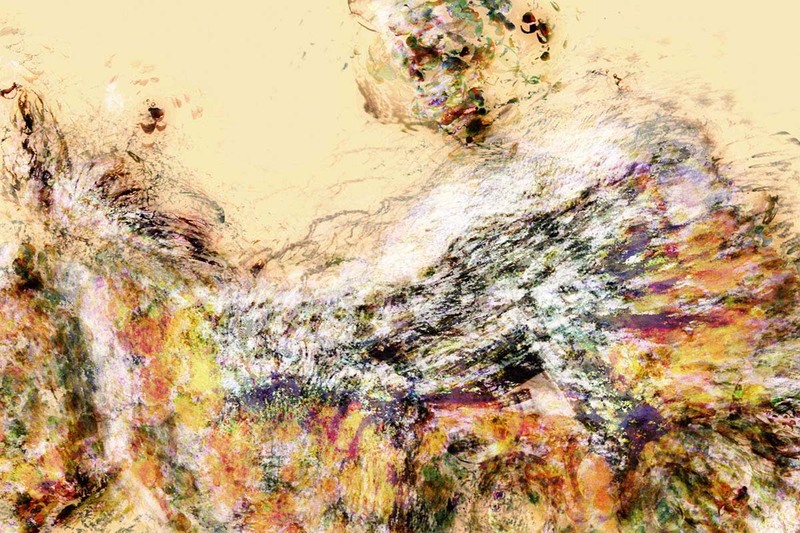 Takagi has exhibited internationally at museums and art festivals, and he has had a number of solo concerts inside and outside Japan. Along with his own artworks, he is most known for producing soundtracks for “Wolf Children” (2012) and “The Boy and the Beast” (2015), critically claimed animation movies by Mamoru Hosoda. Takagi currently lives and works in a village in a mountain valley of Hyogo Prefecture. I created this video while speculating on diverse lives being given birth on this planet and the way they are born. 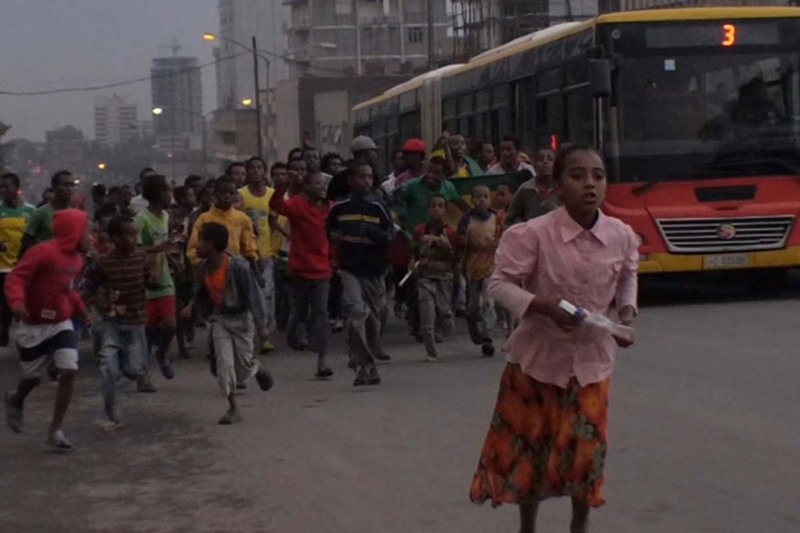 The original footage was shot in Ethiopia, Africa. After I met and saw them living so vigorously with earth in a pristine way, I wished to live like them and later moved to a small village in the mountain after returning to Japan. I wonder what one would feel when every living cell in one’s body comes to blossom. 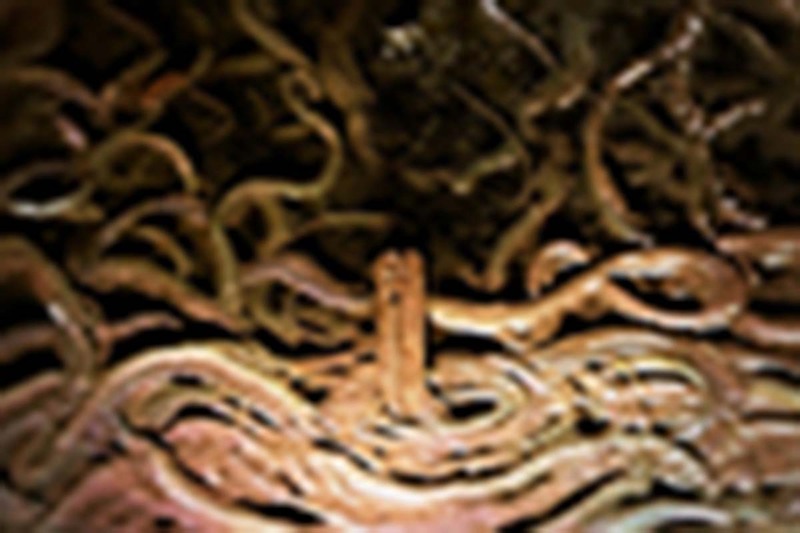 The title “Ymene” refers to “root of dreams”. 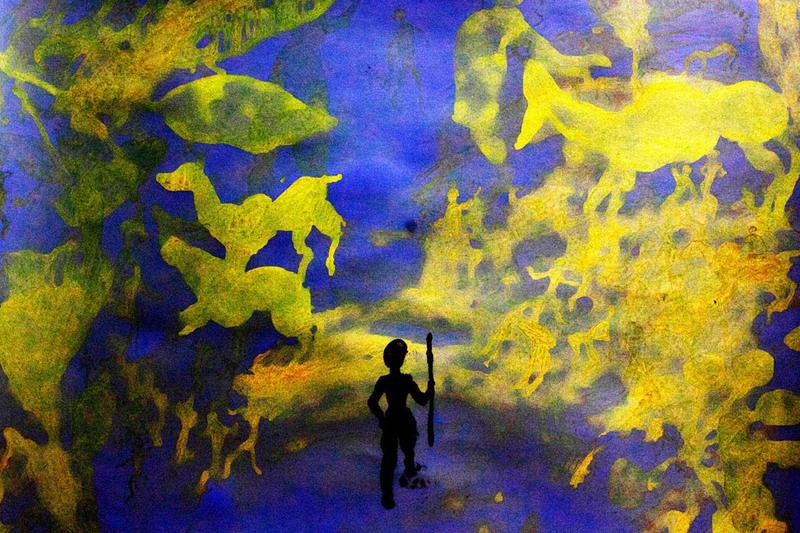 If there were mutual roots in the dreams that humans have had, what would that look like? 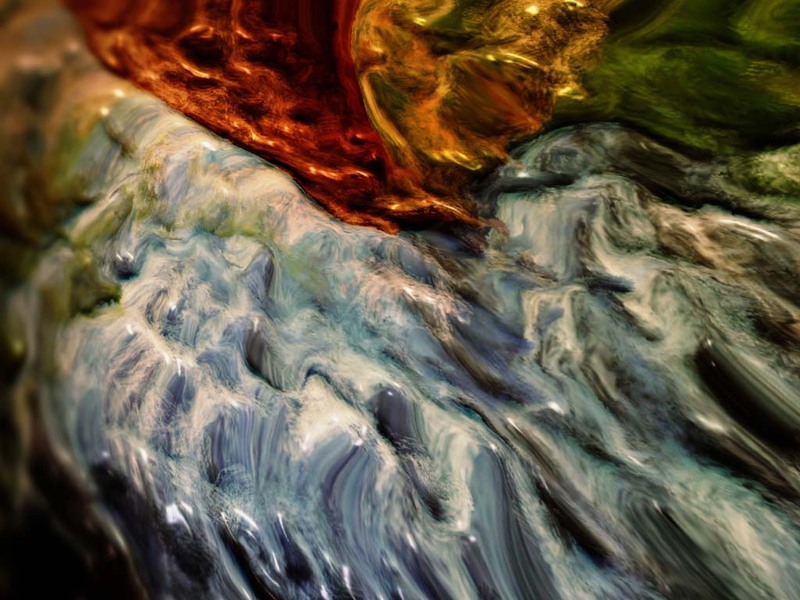 This piece was created after a story about a bird that brought colors to the world after pecking at a snake that monopolized all colors - an aboriginal myth from the Amazon explaining the origins of colors and why this world is bursting with colors. While humans capture the world through three types of color receptors, but birds sees the world with four receptors. 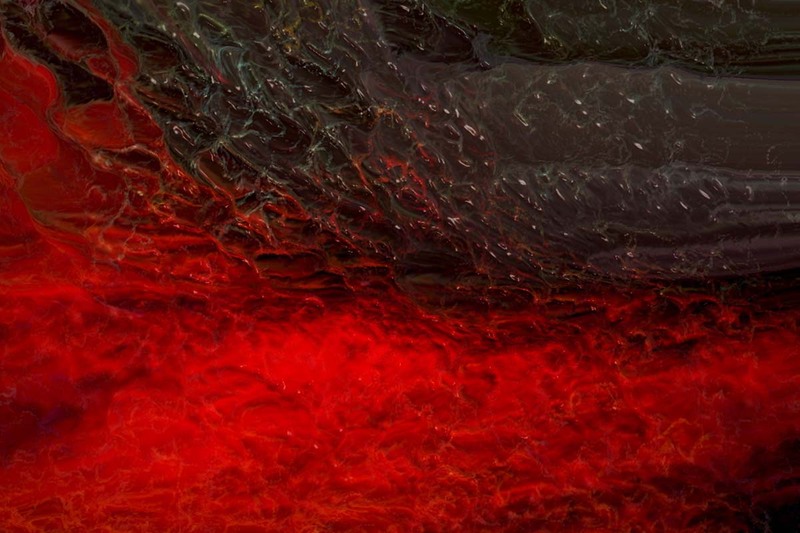 They might see colors like red-green that we cannot even imagine. The world sensible to human is restricted, and even the light from the sun is visible to human eye only in a very limited range. I hope this piece is something to lead our imagination to the true reality that extends unrestricted in front of us. 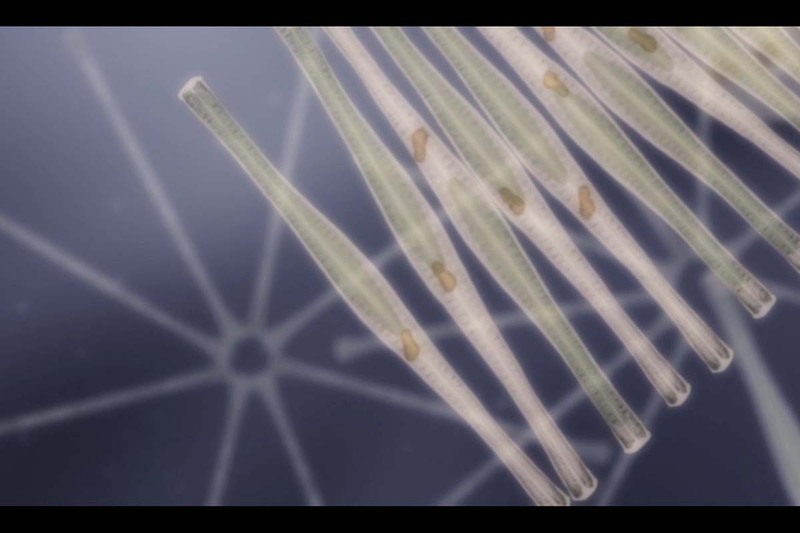 "Water Lives..." is a science communication animation designed to draw attention to the important (yet largely invisible) life that underpins and sustains our freshwater ecosystems. Produced by Rob St.John and Paul Jepson at the Oxford University School of Geography and the Environment for BioFresh - a European Union project on freshwater biodiversity - the animation brings artists and scientists together to collaborate and communicate the concept that freshwater is more than an inert resource: instead a living, dynamic system inhabited by beautiful, important organisms largely unseen by the naked eye. "Water Lives..." invites viewers to view our rivers and lakes in new ways, value the services they provide and discuss how they should be managed. The curious and otherworldly physical form of freshwater organisms such as diatoms provides abundant artistic inspiration. 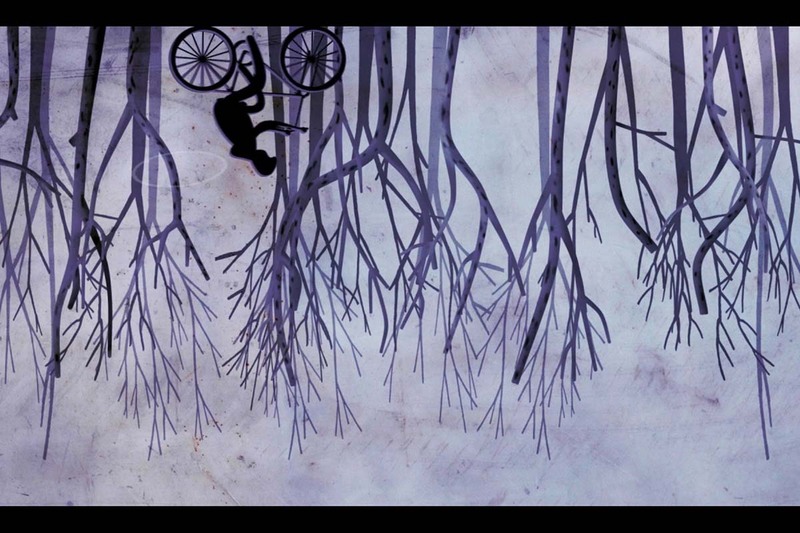 "Water Lives..." is a six minute piece animated by Scottish artist Adam Proctor. It is sound-tracked by a specially composed piece of music by Tommy Perman which samples a series of haiku about freshwater ecosystems written by environmental poet John Barlow. 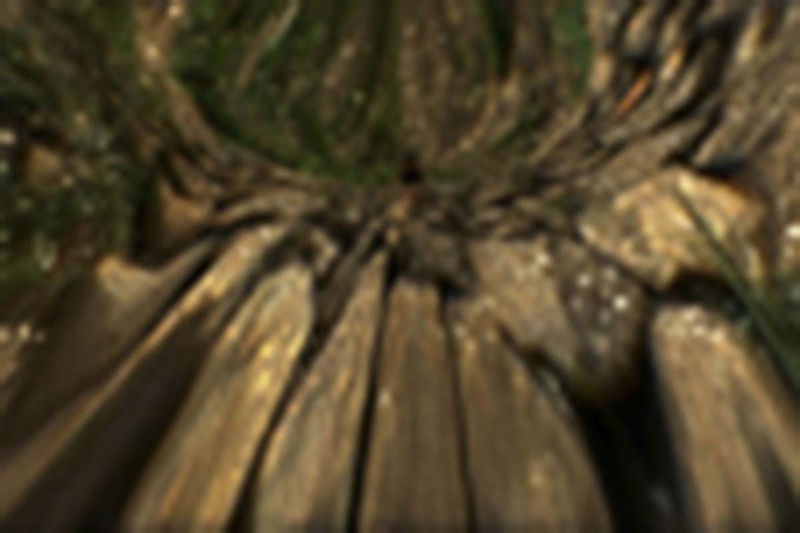 The content of both the animation and haiku was influenced by close consultation with BioFresh freshwater scientists Rick Battarbee from University College London and Ana Filipa Filipe from the University of Barcelona, alongside Alistair Seddon from the University of Oxford Zoology department. 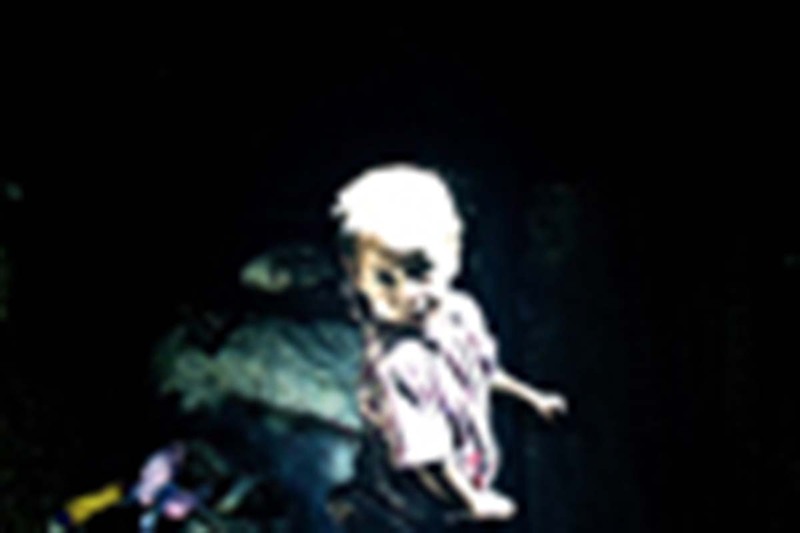 Rob St. John is a writer, artist and producer from Northern England. 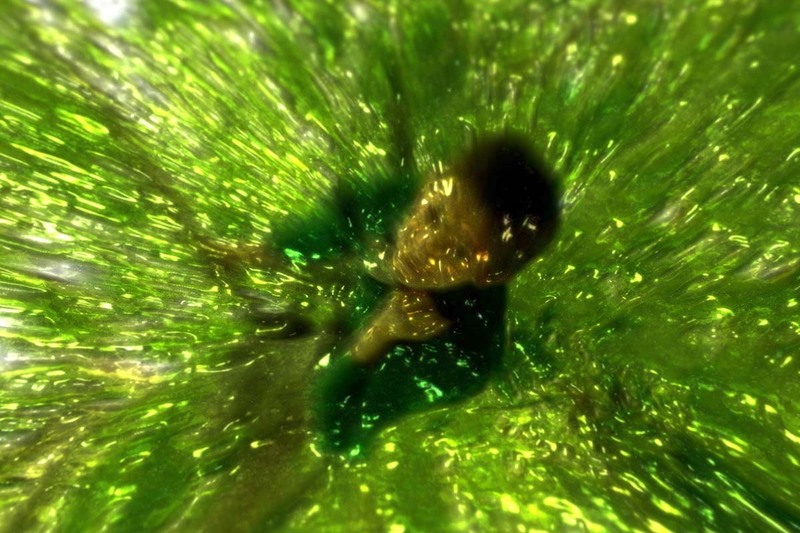 His work focuses on creative (re)representations of landscape, particularly through ecological writing, art, sound and film and art-science collaborations. 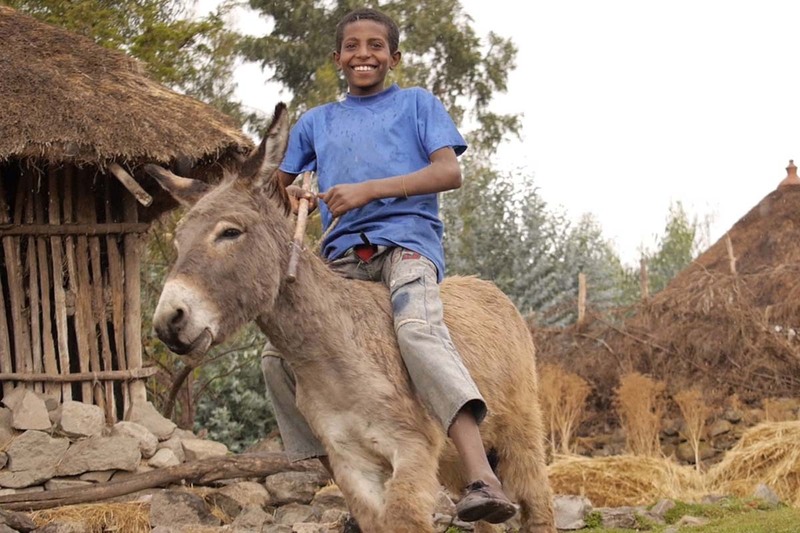 He is a researcher in cultural geography at the University of Glasgow. 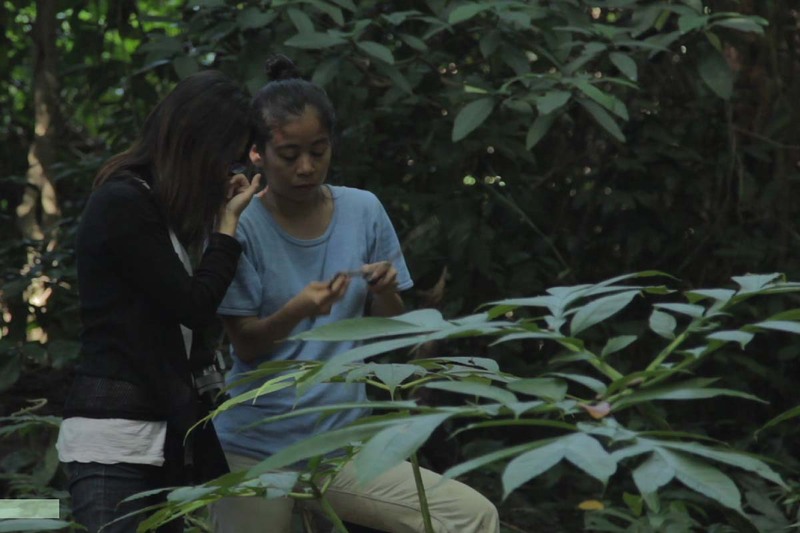 Citizen science has long contributed to the health of local communities by making people aware of their environment in the form of oral histories and traditional wisdom. Recently, the effort to democratize science created opportunities for innovation and a model for public participation in science. These movements rippled into many things such as a kind of revival of traditional knowledge, influential policy forces, changes in how we produce and share knowledge into an iterative and collective process. 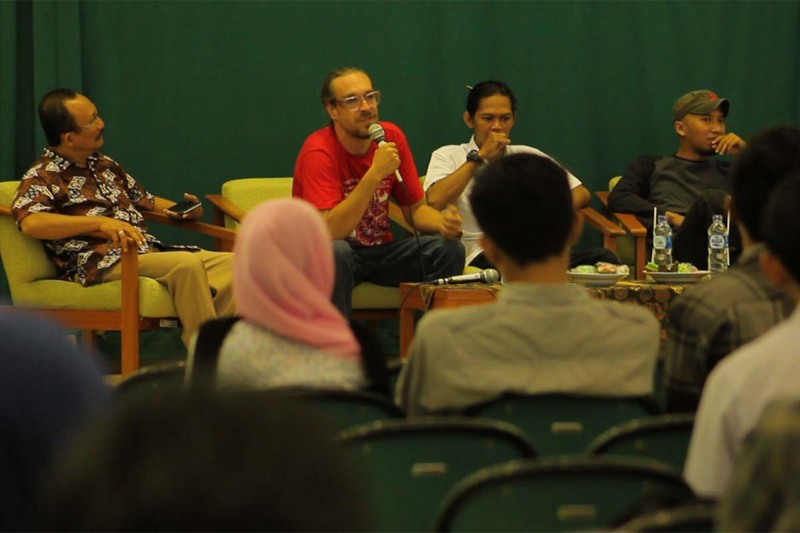 Yogyakarta, Indonesia, has been one of the most active hubs in this movement. What will they be making and for who? Anything along their own practices within the setting of the three ecological nodes which basically are on going projects that are open for people’s participation. They are: Biorecovery of volcanic soil that is run by the Microbiology Department (Agricultural Faculty of Gadjah Mada University); biodiversity conservation in Wonosadi Forest that is run by the Green Tech Community; and environmental monitoring of the rivers in Yogyakarta that is run by Lifepatch. 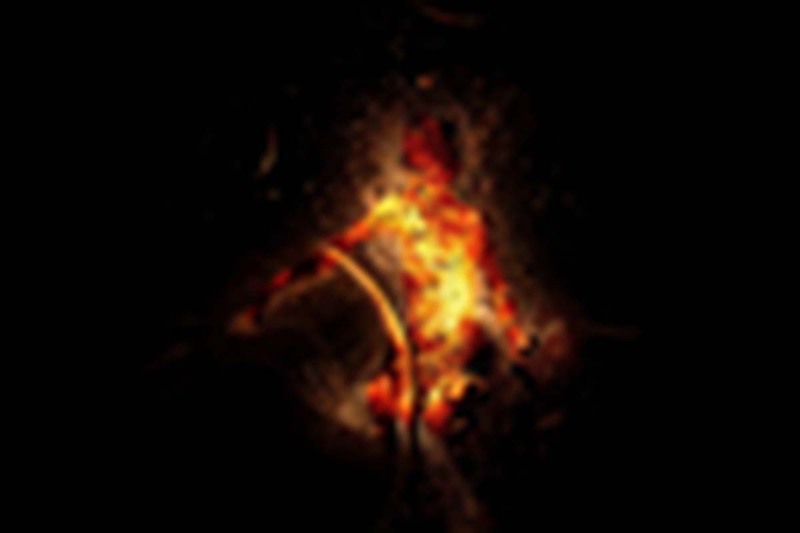 Officially known as a production house, X-CODE Films is also an artists’ collective who does video-based works. They aired Tony Blank Show for the first time in January 2010 without the need to claim whether it is considered as web series, webisodes or whatever. The show paused after three seasons (with a bunch of extras and bonuses) and have reached more than 2,000,000 viewers. The core of X-CODE Films practices is to train (themselves) and the others (including interns) at the same time. Sharing culture, Do-It-Together and Do-It-With-Others spirit is embedded in their activities. Design by alonglongtime & thingsidid.